Pros: There is growing demand for solar powered recharging technology and therefore sales should increase for the whole industry. Ascent is introducing new products in an attempt satisfy this growing demand. Cons: A high debt to cash ratio and a falling share price may mean the company will be forced to move its stock to one of the OTC Markets. Ascent's revenues are growing but are still very small making this company vulnerable to better established competitors with more cash to spend on product development and marketing. Ascent Solar Technologies (ASTI) produces solar powered electronics for consumers, businesses and the military. Some of its most popular products include Surfr, a portable iPhone case and charger and EnerPlex Jumpr, a small power bank that can be transported with ease. The company’s focus is on mobile devices that will charge a wide range of electronics. Ascent’s products are available through online merchants and its own retail website, goenerplex.com. Consumers can currently buy the company’s iPhone charging case on Amazon.com for around $70 but its appeal is mainly limited to outdoorsmen who desire a means of charging their phones while out and about in the wilderness. Ascent operates out of Thornton, Colorado. 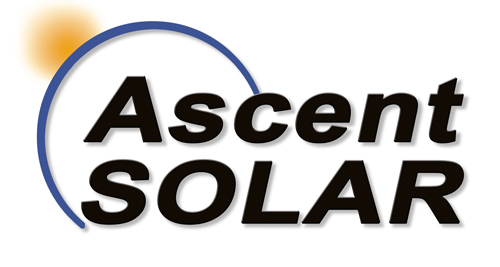 The company website is www.ascentsolar.com. According to Yahoo! Finance, Ascent currently trades at 37 cents a share, below its 52 week high of $1.18. It has declined well over 50% in the past year. Ascent has a market capitalization of about $30 million, revenue of $1.83 million and a gross profit of $1.32 million. Thirty two percent of Ascent’s shares are held by insiders, which is a bit concerning but not too surprising considering that it is a penny stock. What’s most concerning is the debt to cash ratio. Ascent has $6.28 million in debt and is sitting on merely $1.56 million in cash. The company lost $30 million over the course of 2013 and pulled in only $1.3 million in revenues. Yet Ascent’s 2014 first quarter revenues were a healthy $753,000, constituting a big improvement compared to sales of $176,000 in the first quarter of 2013. Ascent states that the revenue boost is due to growth in its line of EnerPlex consumer products. Sales of these devices rose nearly 30% over the course of the quarter. It is worth noting that Ascent’s net operating cash flow has fallen 11% compared to the first quarter of 2013. Unlike many other penny stocks that are traded on the OTC Bulletin Board or OTC Markets, Ascent is listed on the NASDAQCM. It is one of the smaller companies to trade on the NASDAQ, hence the CM label (Capital Market). Ascent doesn’t have enough capital to meet the current NASDAQ (traditional, sans the CM designation) requirements, yet it is still required to submit a variety of financial reports and act in a transparent manner in order to remain listed on the NASDAQCM. The same cannot be said of some other OTC and Pink Sheet penny stocks that are held to less demanding financial reporting requirements. The current share price of 37 cents doesn’t meet the NASDAQ continued listing requirement and in March the company moved from the NASDAQ Global Market to NASDAQ Capital Market which will allow it an additional 180 days to regain compliance of the $1.00 bid price requirement. If the share price can exceed $1.00 this will be a great gain for investors. However, if the share price remains below a dollar the company will most likely to OTC Markets. Analysts have pretty much ignored Ascent, with only one analyst’s opinion cited under Analyst Coverage where the average recommendation is a 3.0 (Hold). The mean target for the stock is a lofty 80 cents, but this price means the company is still a sub $1 penny stock. Achieving this price would constitute a doubling of Ascent’s current price. However, investors should be wary of pinning their hopes on the opinion of one analyst’s price target. Ascent recently announced that it will debut a series of new products at Salt Lake City’s popular Outdoor Retailer Show this August. These products include its Commandr line of solar panel chargers that fold for easy portability. These chargers are half the weight of the competition’s products but produce the same level of power. Industry experts testify to the fact that the Commandr solar chargers are much more durable and reliable than competing products. Ascent’s Generatr line of portable batteries will also be shown to the public at the Outdoor Retailer Show as well. The stock jumped over 8% when the news was announce but the stock price has since floated downward. There is plenty of hope for Ascent’s future, considering the products that the company sells. Solar products are reaching a mainstream tipping point as they become smaller, more portable, easier to use, cheaper and most importantly, effective. The technology is rapidly improving the solar recharging industry is here to stay. Ascent is experiencing significant growth in its consumer oriented line of products. However, will the company be able to compete with much bigger companies with good brand names and lots of cash? The company can turn into a superstar if it finds a way to create useful solar charging products that appeal to the masses. The big question is whether Ascent can prove to be a significant player in this industry. Only time will tell if management will execute a business plan to capture the rising demand for solar powered recharging products. For now Ascent Solar Technologies remains a penny stock to watch.